Best Alcohol For Gout – What’s Yours? 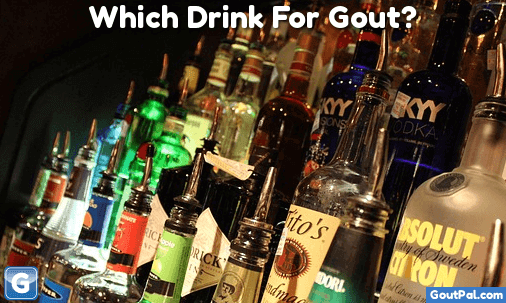 Gout sufferers want to know the best alcohol for gout. Alcohol is (or should be) a small part of your diet. Gout diet is a small part of gout treatment. In fact, you cannot have a gout diet without a treatment plan. Therefore what follows is only of interest to gout patients who want to micro-manage their gout diet. See Best Alcoholic Beverage for Gout summary. If you have a gout treatment plan, but no gout diet plan, I suggest you read my gout diet guidelines before you read this article. If you do not have a gout treatment plan, I suggest you read my gout treatment guidelines first. You should know that the effects of alcohol are different for every gout sufferer. For that reason, I urge you to get a personal gout management plan from your doctor. If you cannot get adequate help from your doctor, please see the links at the end of this article. Do you think alcohol is causing your gout, making it worse, or affecting your treatment? Why do you think one form of alcohol is different from another? In this article, I will explain how alcohol relates to gout and gout treatment. Along the way, you will see that this relationship is very personal. Every person has different reactions to alcohol. Every gout sufferer is at a different stage of gout treatment. This is not so much a question of the best alcohol for gout. More a question of the best alcohol for Your gout. You will see some important principles. Then you must apply those to your situation. I can help you find the best alcohol for your gout. First, read some information about alcohol and gout. Then, you can get personal help below. Bad information about the best alcohol for gout is common, but dangerously misleading. The biggest danger is from people with an alcohol fixation, or even a dependency. This is quite outside the scope of a gout support service. If you have health issues with alcohol, these need to be dealt with in conjunction with your doctor or a suitably qualified clinic. Assuming you simply want to enjoy the social pleasures of alcohol, but worry about the effect on your gout, then you must be clear if you are worried about your symptoms, treatment, or diet. Many people believe that gout can be caused by excess alcohol. Some studies implicate alcohol as a contributory factor. If you feel this may be the case, then the easy way to find out is to stop drinking alcohol. If you suffer less gout, then you have an answer, but only a partial one. You should be more concerned with keeping blood uric acid at a safe level. If you have had a confirmed gout diagnosis, then the safe level is 5mg/dL (0.30 mmol/L). You cannot judge your alcohol abstinence by lack of pain alone. Because uric acid crystals can form very slowly if the concentration in your blood is above the safe level. This will lead to gout attacks in future and joint damage. So be certain that you check uric acid before and during alcohol abstinence. There are also concerns that continuous high intake of alcohol can influence gout via kidney impairment, but this is moving into the realms of alcoholism, and certainly beyond the scope of a gout website. My guidelines for judging gout diet include alcohol. You cannot assess if a single food item or beverage is good or bad for gout. You must assess total diet with regard to 5 bad gout food groups, as described in Foods To Avoid With Gout guidelines. Once you do that, if the contribution of alcohol in your diet makes your diet poor, you can correct it. With your personal diet assessment, you can correct all the problems you find. For instance, excess calories are the biggest cause of diet-related gout. Alcohol is a major source of calories. If that is your situation, simply replace some of your alcohol with lower energy drinks. The best approach to alcohol and your gout treatment is to start by reading the labels. If alcohol restrictions are included in the medicine instructions, then follow them. If in doubt, consult your doctor or pharmacist. We have a specific debate about allopurinol and alcohol, but any gout treatment should prompt a look at alcohol. It seems that the percentage of gout-specific drugs affected by alcohol is quite small. However, the biggest problem is that excess alcohol is a very common reason for non-compliance. In the afterglow of a drinks session, it seems that many gout patients simply forget to take their gout medications. As a one-off, this is not serious, but constantly missing meds leads to under-dosing, and this can be very serious. Because of the lack of clarity, we get a lot of discussions about the best choice of alcohol for gout patients. In my opinion, this is nonsense, but given the high profile of this issue, even within the medical profession, I feel I should explain. In terms of alcohol consumption, it is ridiculous to ask if drinking beer is better than cider, liqueur better than wine, or vodka better than whiskey. We even get questions about mead! For alcohol consumption, the important values are the strength of the drink and the daily consumption. If alcohol affects uric acid processing in your kidneys, then volume and strength are the biggest influence on gout. Therefore, you should think about the strength of the drinks you take, and if you are concerned about alcohol, lower the strength of the drink by adding mixers, or choose a lower strength alternative. The issues become clouded when you consider other properties of alcoholic beverages. For instance, beers contain purines that might be bad, and red wine contains micro-nutrients that may be good. There are gout studies that compare different types of alcoholic beverages. Some of these are useful as a guide to help you micro-manage your gout diet plan. But, they are only pointers. The results are averages of groups of people. Unless you took part in the study, the results have little value. For example, the most quoted study is Choi’s “Beer, liquor, and wine consumption and serum uric acid level.” It suggests that wine consumption does not increase gout. But that is just an average risk. In the details, the gout study shows that uric acid increased in one-half of the subjects, and fell in the other half. 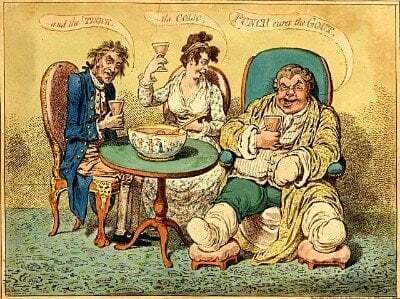 This brings us back to my advice on alcohol and the causes of gout. The only way to determine if one drink is better than another is to test your uric acid. Stick to one drink for at least two weeks, test your uric acid, then switch to a different drink. Retest after at least 2 weeks, then repeat as often as it takes to get reliable results. If you do this, please share your results in the gout forum, where you can also get advice on establishing test procedures that will produce the best results. As you can see, we need to be clear about personal aspects of gout. It can be difficult knowing how alcohol relates to different stages of gout treatment. Your doctor may help you with this, but do you know the right questions to ask? Do you understand your doctor’s responses? If you need help with alcohol for gout see Gout and Alcohol Forumor start a new discussion. Leave Best Alcohol for Gout to browse Gout and Alcohol: Gouty Drinks Truth At Last! TL;DR - Best Alcohol For Gout – What’s Yours? Drinking normal amounts of alcohol has little effect on gout. Gout studies on alcohol are group averages. You have to test yourself to see if specific drinks are good or bad. There are more important things to worry about in gout management. You need a personal plan to manage alcohol and gout.